Dear God No! (2011) – Dear God, Don’t Watch this Crap. This was a waste of time. Really, this movie is a piece of crap. I’ve been a fan of the new wave of pseudo-Grindhouse movies of late, but this crap just doesn’t do it at all. Outlaw bikers killing indiscriminately, and evil scientist and actors that can’t act. I want to punch eveyone involved in this movie in the face. I think this is a part of a new genre that I will coin, Craphouse. 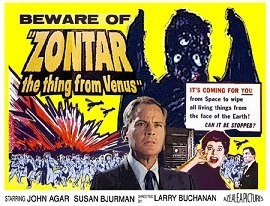 Oh, this is another bad, Public Domain Sci-Fi movie I found of the Internet Archive. There really aren’t many redeeming values to this movie other that it’s campiness and silly creature design. It’s god bad acting galore and next to no busget – I think it fits on this page perfectly. So, the US has launched a Laser satellite that Zontar, the thing from Venus needs to complete his plan to come to Earth and take over human kind. One scientist is working to help Zontar (under the belief that Zontar means to help mankind) and another scientist works to thwart Zontar’s plans. Throw in the military, some rocket scientists (including one played by Jeff Alexander – star and antagonist of Curse of the Swamp Creature – another terrible film I spotlighted here on this blog a few weeks ago). Like the URL for the site reads, I like bad movies, but I have to say I didn’t like this one. I only watched it because a friend of mine had read about it in Fangoria magazine, where they touted the sheer volume of on screen kills. There were a lot of kills – but the CGI used looked worse than some that I experience in early Sega Saturn games (read that as bad). Broken into several “chapters,” each with it’s own story – this disjointed piece of crap bored the hell out of me. Don’t bother with this film – it is real junk that doesn’t deserve the time it took to write this. 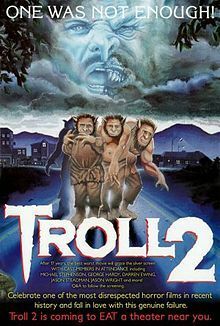 I watched Troll 2 back on Friday, April 20, 2012 and I am still shaking my head at it. I had heard for years that this was one of the worse movies ever made, but somehow I had not watched it yet. Released in 1990, and despite being called “Troll 2” there are no Trolls in the movie, or even mentioned. The movie is full of Goblins, and has absolutely no connection to the original movie, Troll. The reason the movie piqued my interest is because I recently watched a documentary about the film called “The Best Worst Movie” (http://bestworstmovie.com/) which reunites the cast and director to discuss their experiences making the film and what they are up to now – a fun, documentary about a pathetic movie. I just had to watch it after that. The story (if you can call it that) is about a family that are taking part of a holiday home swap with a family from a town called “Nilbog.” When they arrive they find a strange town filled with strange people. The family’s son is tipped off to the evil lurking in Nilbog by his dead Grandfather, and he must find a way to save his family. Bad, bad, bad movie, but I am glad I watched it. Only watch this if you truly enjoy watching bad movies for bad movies sake.